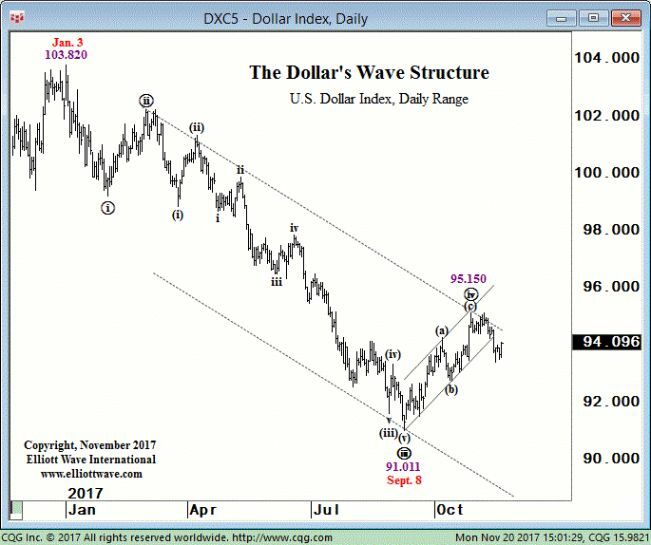 With that in mind, let's review how our U.S. Short Term Update editor made this bearish call on the U.S. Dollar Index last November. The advance from the 91.011 low on September 8 to the 95.150 high on October 27 is still best labeled a three-wave structure. The implication of a three-wave advance is that the next-larger-degree of trend is down. So the dollar should eventually decline below 91.011 to complete the pattern from the January 3 high. The Elliott wave "basics" delivered: That's exactly what happened. The [U.S. Dollar Index] declined to 88.253 today, breaking below the wave iii (circle) low. Prices have satisfied the minimum expectations for wave v (circle) and we are now able to label wave v (circle) complete. In turn, a complete fifth wave also means the five-wave decline that started at the 103.820 high on January 3, 2017 is complete. Prices should now be starting the largest advance of the past 13 months. Indeed, the U.S. Dollar Index began to rise from that very day. The [U.S. Dollar Index] jumped sharply to 90.147 today in the largest one-day intraday rally in 5 months. Interestingly, around the last week of March, a group of hedge funds held its largest net-short position in U.S. dollar futures and options since August 2011. Will the hedge funds turn out to be right, is the dollar rally expected to reverse? Maybe. But remember, crowd psychology at big market turns often reaches an extreme like that, which -- from a contrarian perspective -- only helps you to validate your "basic" Elliott wave analysis. 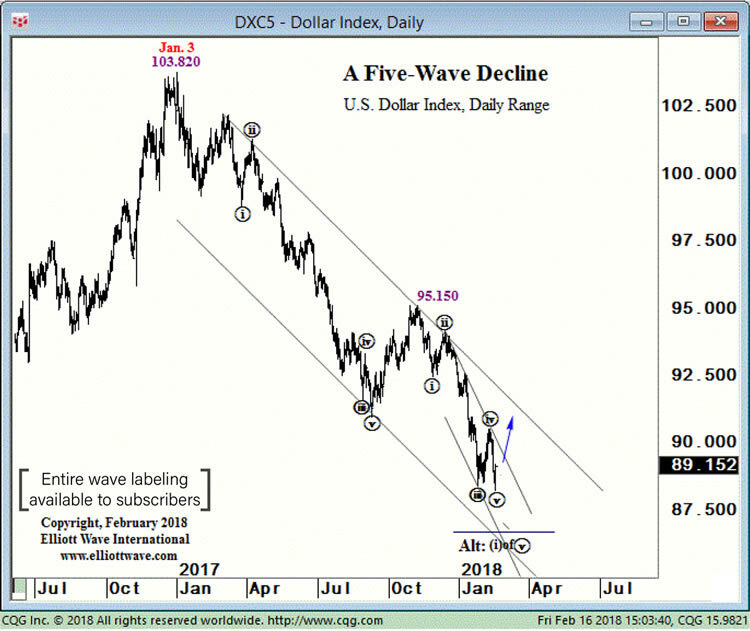 This article was syndicated by Elliott Wave International and was originally published under the headline U.S. Dollar: Why It Pays to Use the Elliott Wave Model. EWI is the world's largest market forecasting firm. Its staff of full-time analysts led by Chartered Market Technician Robert Prechter provides 24-hour-a-day market analysis to institutional and private investors around the world.